Earlier this year we recapped our first three workshops of 2017. Now that the year is nearly over, after finishing our last workshop of the fall just a few weeks ago, we run down how the rest of itinerary went. Rounding out our second year of workshops was a procession of amazing locations, students and celestial events, including the total solar eclipse, an impregnable fort in the ocean, deep canyons and dark skies, ancient Puebloan ruins, eye-popping aurora borealis, and alien desert landscapes. 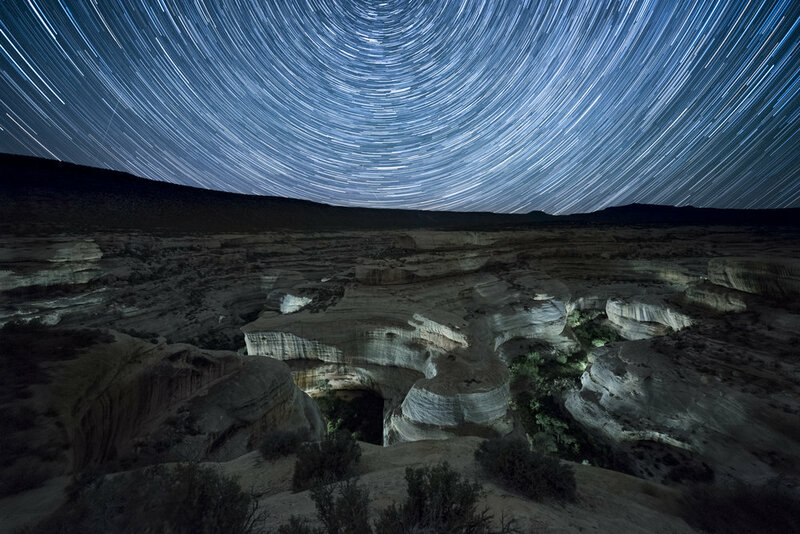 Each year we have partnered with the Rocky Mountain School of Photography to offer a night photography workshop. 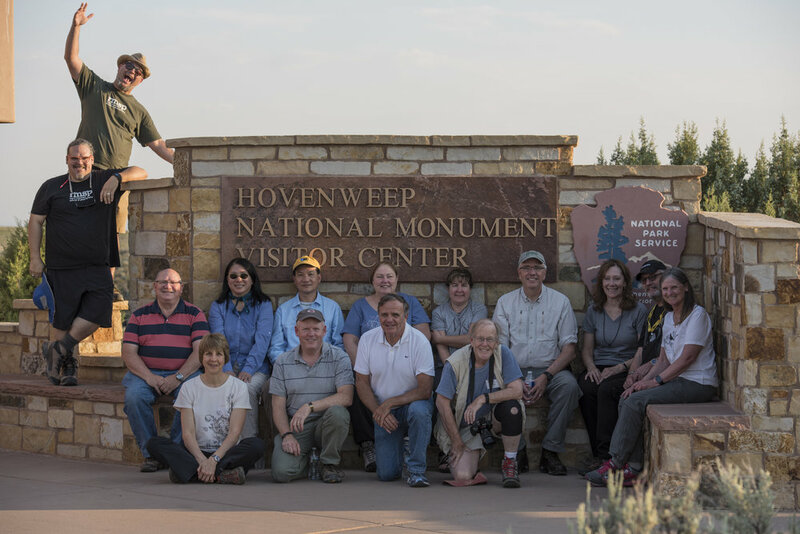 This year we were very excited to teach for them at one of the darkest sky locations in the United States: Utah’s Natural Bridges National Monument and Hovenweep National Monument. This was a very challenging workshop, but as with any challenge, if you succeed then it is incredibly rewarding. The biggest hurdle was part of the beauty—both locations are very remote. We based our workshop in the town of Bluff, which was one hour from Natural Bridges and about 50 minutes from Hovenweep. Combine that with a summer Milky Way focus, and we weren’t starting to shoot until 9:30 to 10 p.m. and weren’t calling last shot until 2 or 3 a.m. To everyone’s credit, we were thrilled with each location and got home safely each night! The first two nights we divided the class in two and had them either climb the 1-mile descent down the slippery rocks and ladders to the majestic Sipapu Bridge or photograph the Milky Way perfectly aligned over the Owachomo Bridge. The third night we explored the smaller canyon that was lined with Indian “castles” and ruins along the edge. We had stellar Milky Way skies but the challenge again was hot, hot, summer nights. The daytime temperature was 114 F and at night it cooled to a pleasant 85 F. Long exposures without noise reduction were limited to 30 seconds or 1 minute to prevent excessive noise from the heat. Natural Bridges National Monument. Nikon D750 with a 15mm Zeiss Distagon f/2.8 lens. 75 stacked 1-minute exposures at f/2.8, ISO 6400. One of our more adventurous Passport Series workshops of 2017 was in Dry Tortugas National Park, which sits about 70 miles from Key West in the Gulf of Mexico. We were very fortunate to partner with the Key West Art and Historical Society and Dry Tortugas National Park for this immersive experience. We kicked things off the day before the workshop with Tim and I presenting our favorite night park images at the Night Sky Symposium held at the Florida Keys Eco-Discovery Center. 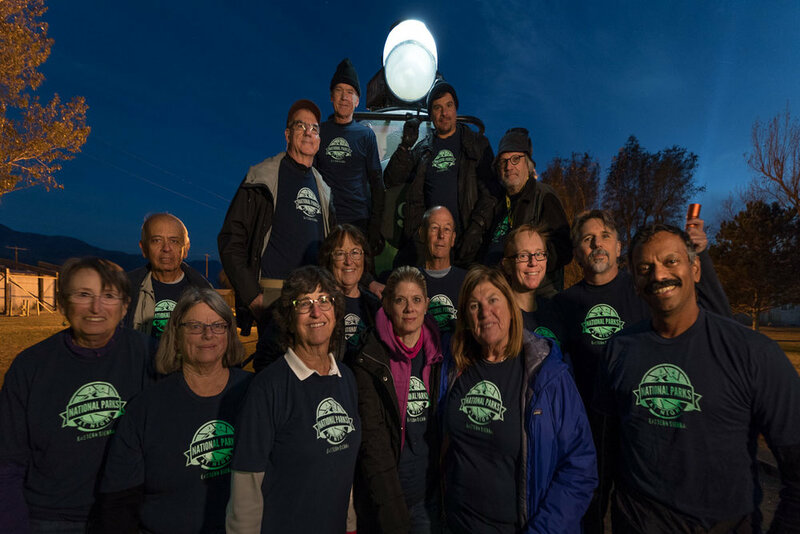 Kelly Clark, cultural resources specialist from Dry Tortugas, led off with an overview of the restoration and upkeep of the massive Fort Jefferson, then two local astronomers gave a very thorough overview of Florida night skies. The next day we met the entire workshop class and spent the day going over night photography as well as learning the history of Key West with a private tour of the museum at the Art and Historical Society. That night we put our night photography skills to the test at Fort Martello, where we practiced light painting and tested our high ISOs and long exposure parameters in the hot and humid heat of Florida. Then at midnight we boarded our private boat for a three-day tour. We woke to Fort Jefferson tiny on the horizon. The next two days and nights would be a full-on focus of Dry Tortugas. Most people get to visit this park for only two to three hours when the Yankee Clipper boat brings them in and out. Though the park has room for about 20 people to tent-camp, visitors don’t get access to the inside of Fort Jefferson after sundown. But we did! We kept cool during the day by snorkeling and swimming, and also used daylight hours to scout for the best compositions. At night we had full access to the fort, and each window and path led us to fantastic nightscape images. Life on the boat was a little cramped but the crew was amazing and the food top-notch! On our ride back to Key West we all started working on editing our photos for a public presentation at the Art and Historical Society. This turned out to be a huge hit—about 50 people attended. We put all the students’ work together and gave a brief talk about our recent adventures, followed by an hourlong Q&A and a celebratory group dinner. Follow-up: Key West and Dry Tortugas were hit hard by Hurricane Irma. Fortunately our friends were safe and damage was minimal to their lives. A part of the famous walkway around the moat of Fort Jefferson was broken, so you can no longer walk all the way around—but I guess that makes for new picture opportunities. Stay tuned; we hope to partner with Dry Tortugas and the Key West Art and Historical Society again in the near future. Our intrepid group of night photography adventurers joined Lance and I in the mysterious and wildly unpredictable southern oasis of beauty in Colorado. Great Sand Dunes is a rather small park with only one entrance and basically one parking lot from which you can access the dune field and Medano Creek. That is, without renting a 4x4, deflating your tires and driving in the arid backcountry. This was my fourth visit to Great Sand Dunes, and my second visit during the Perseid Meteor Showers—the very event we came to teach and capture. August is also monsoon season. Yeah. The park is nestled against the Sangre de Cristo Mountains on the east in a valley 50 by 100 miles wide. When a storm rolls through, it can come from practically any direction, including over the 13,000-plus-foot mountains towering over the dunes, which start at about 8,000 feet and rise to over 8,700 feet. Needless to say, we had to roll with whatever the weather threw at us, and boy did it throw. We began with a night by Medano Creek at the foot of the dunes. The creek was abnormally high from the recent daily afternoon thunderstorms. We witnessed the surreal “surges” that look and sound like rolling waves on the ocean, only they rush downcreek up to 3 inches higher than the normal flow—an odd sight in what otherwise appears to be a strictly dry, desert scene. A couple hours into shooting, a storm front came blowing in from the east over the mountains and whipped sand around madly. So we packed up and headed into Alamosa to finish out night-shooting historic train cars. Our second evening we planned for an ascent onto the dunes, but heavy clouds helped us choose Plan C instead: a Tibetan Stupa high on the mountainside overlooking the valley a bit north of the park and accessed from a primitive road leading south from quaint Crestone, Colorado. The group spent the evening marveling over the somber beauty of the spiritual space, with the Milky Way arcing overhead and with the view of the valley below. Our third evening was the big one—the hike up the dunes. The skies played nice and we huffed and puffed our way up the equivalent of 70 flights of stairs on what felt like cane sugar. At 8,000-plus feet! Not for the faint of heart, yet our entire group made the hike (and we’re hella proud of them!). We were rewarded with an amazing view of the Perseids, a lightning storm playing behind the Sangre de Cristo mountains, and the obvious signs of civilized life (read: light pollution) to the south in Alamosa. Our fourth and final evening included sunset at Zapata Falls overlooking the valley, some far-off storms and a compressed view of the dunes snuggled up to the mountains. We had a ton of fun playing with light writing, light painting and doing some night portraiture. Everyone got to do some work on their goals and the result was a grand slideshow of our students’ efforts. Bravo and brava to all of our students. This workshop was challenging in so many ways, yet they exceeded, and we are really honored to have had this killer adventure together. The green and luscious Centennial Valley has miles of big night sky and a population under 100 in the summer. The beauty is eternal, the community kind, and the cowboy hats fit like a fedora! 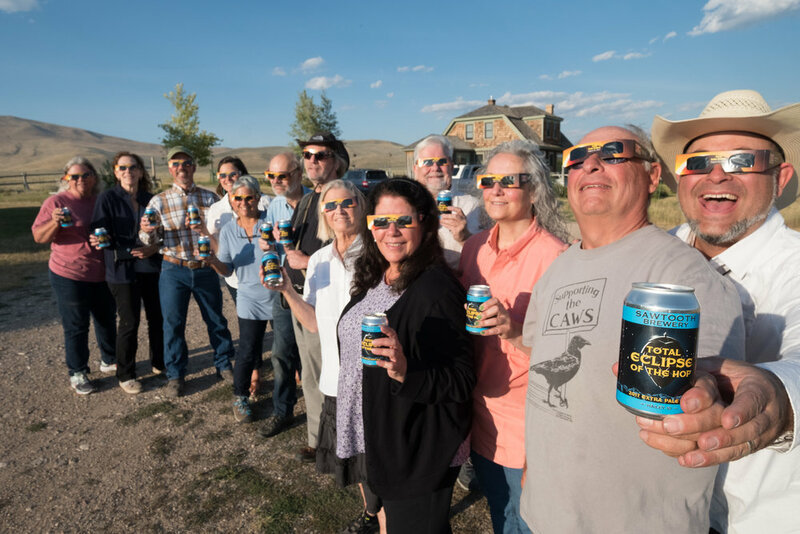 Add to that the first total solar eclipse that any of us on the workshop had ever photographed and you have the makings of an ultimate experience. Weather is always a factor, and when we landed in Montana, smoke-filled skies burnt our eyes. Montana and much of the rest of the West was experiencing some of the worst forest fires in history. Luckily for us some rain came just in time, right before the workshop kicked off. So we headed south to Exit 0 in high spirits. Everyone arrived in time for dinner on the first night, created by our Chef Eric, who was catering all our meals from his free-range kitchen. Our first night brought us crisp, clear and star-tactic skies. We strolled down to the river and shot the reflecting and rising Milky Way over the water. We had a very experienced group and everyone experimented a little bit and came away with some spectacular shots. The daily schedule consisted of breakfast, morning horse rides or nature walks, group lunches, one-on-one sessions with me, down time, a group dinner, and then night shoots. I really enjoyed the bonding aspect of this workshop; everyone had solo or shared a rustic cabins, but were often found hanging out and working together on images or practicing shooting the sun. Instead of formal classes, I opted for the aforementioned one-hour individual sessions with each participant. This proved to be incredibly successful to further bond us, as well as to help answer attendees’ specific questions and push their visions along. Some people showed portfolios, others went over gear, and some were a combination of all. 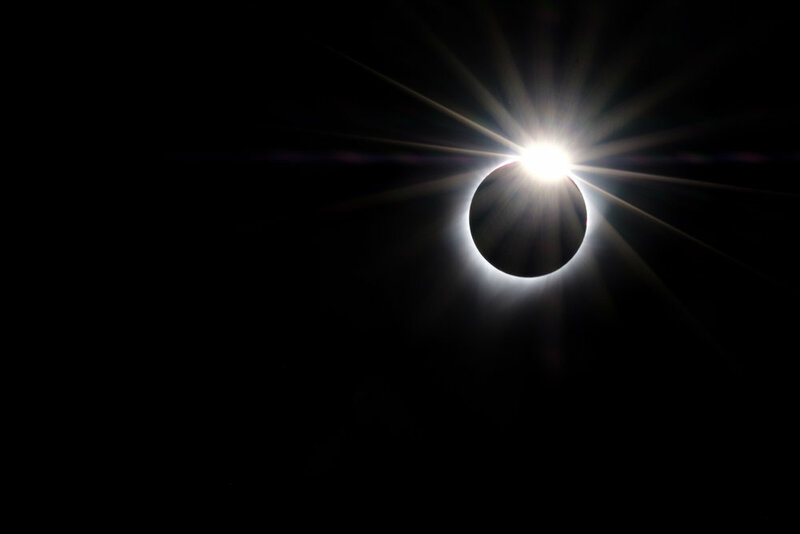 Bailey’s beads (aka, the diamond ring effect) during the 2017 total eclipse. 1/15, f/22, ISO 800. © 2017 Gabriel Biderman. All in all, it was an incredibly thrilling workshop and experience. I look forward to more adventures with my friends, and to experiencing the next total eclipse in 2024! Gabe and I led National Parks at Night’s first international trip, to the Westfjords of Iceland at the very end of August and beginning of September. We chose the Westfjords because it is the least visited part of the country, and we chose to go at the end of their short summer because of the possibility of seeing the northern lights without having to suffer the dead of winter. I think the group would tell you that it was worth every bit of effort to get to that far northwestern corner of the tiny island nation in the North Atlantic. We were fortunate too in that auroras graced us with their amazing presence on multiple nights, including one night when the entire sky glowed green for hours on end. We had chosen a location with panoramic views in all directions to photograph, because at 64 degrees north latitude, an aurora can appear anywhere in the sky––and it did! The lights were so ubiquitous and long-lasting that Gabe even made a series of individual “aurora portraits” of the entire group (see our “group photo”collage, above). It was unanimous that Djupavik was the group’s favorite location, and it’s ours too. The site of a former herring processing factory, Djupavik was converted into a small hotel in the late 1970s by a couple from Reykjavik with a unique vision, and is now lovingly run by their son-in-law Magnus. There’s little doubt that we’ll be back. Note: Speaking of going back, we have a few spots remaining in our upcoming March trip to Iceland, which will take us along the south coast to see both some of the best-known waterfalls in the country, and also to some off-the-beaten-path locations that are just as amazing for photography. If you’ve ever heard me talk about Olympic National Park, then you know it’s one of my favorite places. So it could probably go unsaid that I was very much looking forward to leading a workshop there—to share the experience of Olympic with my co-instructor Matt and with the 18 amazing photographers attending the two back-to-back workshops, many of whom had never been there. The two workshops were similar, but also varied a bit, as weather and other factors often allow for a fair amount of serendipity. During the first week we started at Lake Crescent and later Elwah River Valley (which just a few years ago was a lake, until the century-old dam was dismantled to restore historic salmon runs). At the latter, we were able to use information gathered during our daytime scouting with PhotoPills to plan on shooting the Milky Way hovering over the valley with the river leading right to it. It was an amazing scene! On the second night, fog and snow greeted us at Hurricane Ridge, and we used the conditions to create some moody light painting. Later we moved down to sea level, where we shot for the rest of the night at the Port Angeles waterfront. 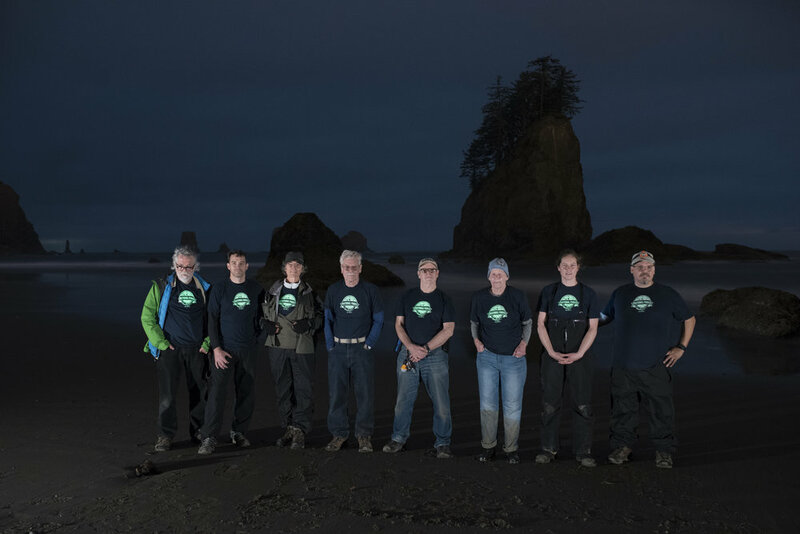 Then we headed out to the coast to shoot at Ruby Beach on the third night, the Hoh Rain Forest (and Ruby again, as the stars returned) on the fourth, and ended the workshop under beautiful skies at Second Beach. The second week we changed a few locations. We started at Hurricane Ridge, and on the second night we hiked to Marymere Falls, where we light painted the 90-foot waterfall with a pair of Luxli Viola LED panel lights, with Matt changing the intensity and color temperature remotely via his iPhone. On the way out through the new-growth rainforest, everyone stopped at different points to photograph the majestic trees, before ending the night on the shores of Lake Crescent. Once on the coast, we started with the hike along Rialto Beach to shoot the entire third night near and at Hole-in-the-Wall. The fourth night we shot at the Hoh Rain Forest and Ruby Beach again, where we got the amazing treat of seeing and photographing an aurora over the sea stacks and coastal cliffs, as bioluminescent plankton lit up the waves beneath. Then we once again ended the workshop at Second Beach, albeit this time in moody fog and mist. During both workshops we focused primarily on light painting, Milky Way and star trails, and Matt did a fair amount of side instruction for participants who wanted to learn about night portraiture. Over the course of both workshops, Matt and I got to spend 17 days in this amazing place (which we talked about in a video we released shortly afterward). There were a variety of experiences that we won’t soon forget—a sentiment I hope and trust that the attendees share. The arches and rock formations of the Alabama Hills are challenging to photograph and light paint, but our group took to it with aplomb. Lighting the arches well requires some scrambling over steep and uneven surfaces, and in the case of Lathe Arch, wedging yourself and your camera into a narrow crevice to get low enough to have a good angle. We chose to hold this workshop around the full moon because of the challenging nature of the topography, and because we wanted to emphasize light painting. With so much emphasis on Milky Way photography these days, it was great to get back to our night photography roots and work in bright moonlight for a change. The sheer scale and number of radio telescopes at the observatory was a treat for all to experience. The Cal Tech staff was generous in giving us access to their facility, and we made the most of it. Even though we normally scout each location in person and try to plan every detail of our workshops before the attendees arrive, sometimes opportunities appear that are too good to pass up. Such was the case with our surprise visit to the Laws Museum, a place that was unknown to both Tim and I until the signal tower caught our eye as we were passing by on the way to check out the petroglyphs. Considering the richness and diversity of both the natural and historical sites in the region, a workshop along the northern part of the Highway 395 corridor is sure to follow someday. Last, but always first in our hearts, is a big thank you to the most important people in our program—our participants. The energy and enthusiasm these photographers brought to the workshops cannot be paralleled. We were thrilled to work with everyone who attended our workshops in 2017, and look forward to all the new places where we’re learning and shooting in 2018. Browse our new adventures here and grab a seat before they sell out. BenQ sent a SW2700PT 27-inch display to some workshops this year, including Cuyahoga Valley National Park in Ohio (above), for attendees to use for image editing and review. Nikon sent some of the best photography gear ever made for students to use for free. The kit they shipped to each workshop included a wide range of cameras, including the D5, D850, D810A, D810, D750 and D500, plus a huge selection of lenses, including the awesome 14-24mm f/2.8, 20mm f/1.8, 28mm f/1.4 and more! B&H Photo sent along loaner gear such as intervalometers, remote shutter releases and bubble levels. BenQ provided projectors for presentations and the crystal-clear SW2700PT 27-inch display at two of our workshops for attendees to use while editing. Light Painting Brushes provided a Deluxe Starter Kit for attendees to practice light writing. X-Rite supplied an i1Display Pro to profile and calibrate anyone’s laptops and the instructors’ projectors. Bay Photo provided free prints to award to attendees in random drawings, as well as a 25 percent discount to all the students. Peak Design supplied a random giveaway as well, in the form of their Clutch strap. Irix Lenses sent 11mm f/4 and 15mm f/2.4 Blackstone lenses to several workshops for students to borrow and love. Luxli sent their brand new Viola light panels to several workshops as free loaners, prompting all five instructors and scores of students to buy them. Finally, here’s to you, for reading, subscribing and attending. We appreciate you, and your support. Seize the night, y’all.